Last month, Chicago magazine published its annual Best of Chicago issue, purporting to list the city’s top destinations in categories ranging from “culture and fun” to “shopping and style.” Of the fifty-seven places chosen, only four—and none of the restaurants—were located on the South Side. Of course, this is not unusual: we’re used to seeing the South Side left out of the “best” lists produced by mainstream publications, from the infamous 2015 Chicagoist list of the city’s best tacos with no restaurants in Pilsen or Little Village, to an Eater list of the twenty best seafood restaurants, published just last week, highlighting establishments mostly clustered on the North Side. Even if we’re jaded, it’s still infuriating to continually see an entire swath of the city so completely dismissed. And this isn’t just about petty crosstown rivalries. Underlying the assumption there’s nowhere worth hanging out on the South Side is a decades-old journalistic approach that sees most of Chicago as nothing more than a poverty mill or battleground, a place ripe for sentimentalism and scolding but never appreciation. At the same time, however, South Side residents know that we don’t need to rely on institutions like Chicago to affirm the existence of the sacred spaces in our backyards. The giant quesadillas at Machetes Big Quesadillas in Archer Heights will be a marvel regardless. Over in Auburn Gresham, every seat in Cookie’s Cocktail Lounge was filled for the weekly Snake’s Brunch before anyone wrote about it. 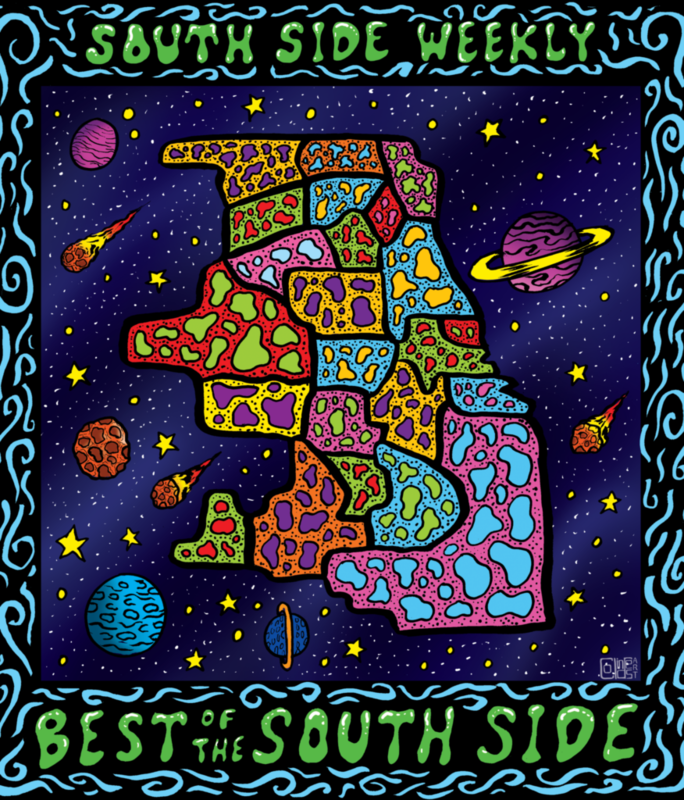 And the point of our annual Best of the South Side issue is not to wave it in the face of the North Siders who have never bothered to explore much of the city—no, we’ve collected this assortment of bests to celebrate the South Side gems we love and to pay homage to the sites that structure our everyday lives. So take this opportunity to revisit that storied spot in your neighborhood, or try something new across town. Debate with your friends about which burger and which taco is the best. Relax in one of the many parks described in these pages (whether you’re into sculpture, or woods, or fishing, we’ve got something for you). The content in this issue—our sixth annual Best of the South Side—is only here because of an approach to journalism that seeks to include as many voices as possible, that asks you to tell us what you like about your neighborhood in your own words. And if we didn’t include your “best,” be sure to let us know—or join us next September, when we’ll do it all again. What the heck is the “south east side”? Maybe take a visit from your South Loop condo to the East Side sometime. What a wonderful exploration of neighborhoods!